Thule Cargo Box MultiLift , Truck & Car Racks from Proline: Thule Racks, Yakima Ski Racks, Bike Racks Canoe and Kayak Racks Cargo Carriers and Truck accessories. Thule 572 multilift. Easy way to store your roof top cargo box. 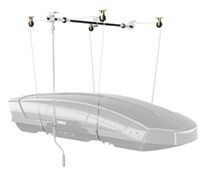 Also functions as a Kayak and Canoe hoist system.